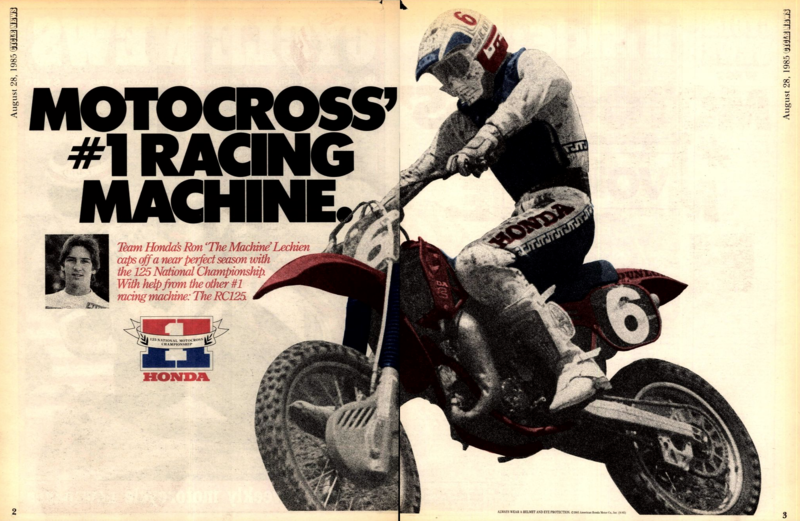 Team Honda's Ron Lechien clinched the 1985 AMA 125cc National Championship with a win at the next-to-last round at Spring Creek in Millville, Minnesota. The Dogger was followed by Yamaha's Keith Bowen and Suzuki riders George Holland and A.J. Whiting. 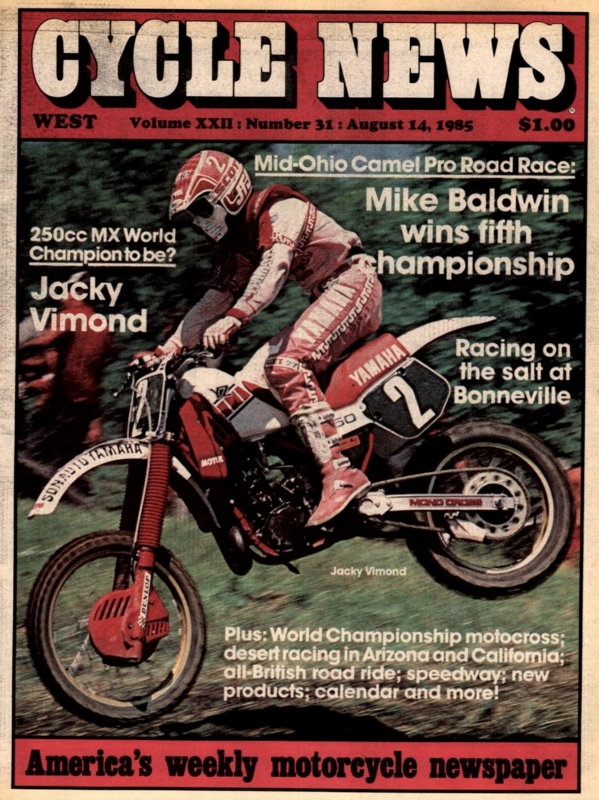 In the 250 Class at Millville, Bob Hannah showed that he still had the speed to win, going 1-2 to win what would turn out to be his last AMA National victory in his epic career. Hannah's Honda teammate Johnny O'Mara went 3-1 for second, Yamaha's Ricky Johnson 2-3 for third. Series points leader Jeff Ward placed fourth. In the 500 Class Yamaha's Broc Glover had already clinched the title (his sixth) at the previous round in Binghamton, New York, and decided to sit Spring Creek out. Honda's David Bailey took full advantage and went 1-1 on the works Honda, despite riding with a heavily-bandaged wrist. That made it a clean sweep on the day for Team Honda. Team Tamm Kawasaki rider Alan King finished second, Yamaha Support rider Eric Eaton third. In one of the all-time meltdowns at a final championship round, French Yamaha rider Jacky Vimond rode into the final 250cc Grand Prix in Germany with a comfortable 12-point lead on Austrian KTM rider Heinz Kinigadner, the defending 250cc World Champion. But on the slick Goldback circuit Vimond could never find his rhythm, and he would struggle to 12th in the first moto. Kinigadner, second in the first moto, suddenly found himself with a one-point lead, marking the first time all season that he was ahead of Vimond in points. The second moto did not go much better for Vimond, who was trying to become France's first FIM Motocross World Champion. 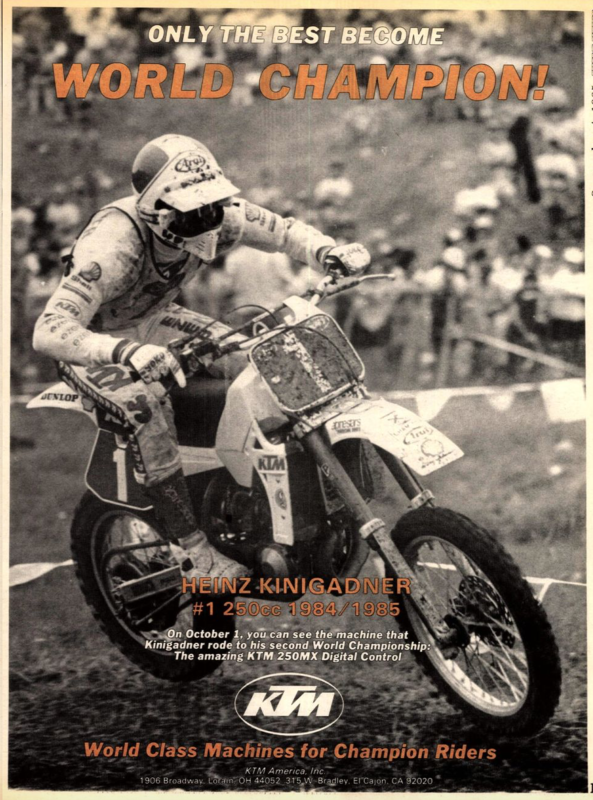 He finished seventh, one spot behind Kinigadner, which gave Heinz and KTM the title by two points. Jacky Vimond was poised to be France's first world champ in 1985, but it would have to wait another year. At the final round of the FIM 500cc World Championship, Finland's Heikki Mikkola won his first world title by finishing 1-6 in the mud in Luxembourg, ending his rival Roger DeCoster's three-year winning streak. The winner of the race was Belgium's Jaak Van Velthoven on a Yamaha. The championship would makrk Husqvarna's last of many in the FIM's 500cc World Championship category until Jacky Martens in 1993. 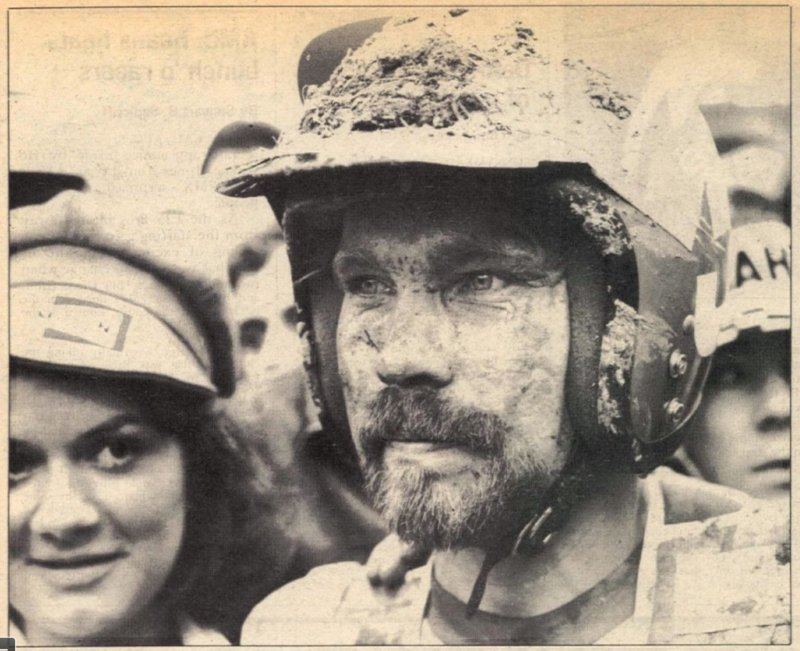 A screen grab from Cycle News of Heikki Mikkola at Luxembourg in 1974. Jean-Michel Bayle dominates the Washougal 500 National, going 1-1 on his factory Honda CR500. Bayle, who has already claimed the '91 AMA Supercross and AMA 250 Motocross titles, will soon add the 500 title, the only time in motocross history that someone accomplished that feat. 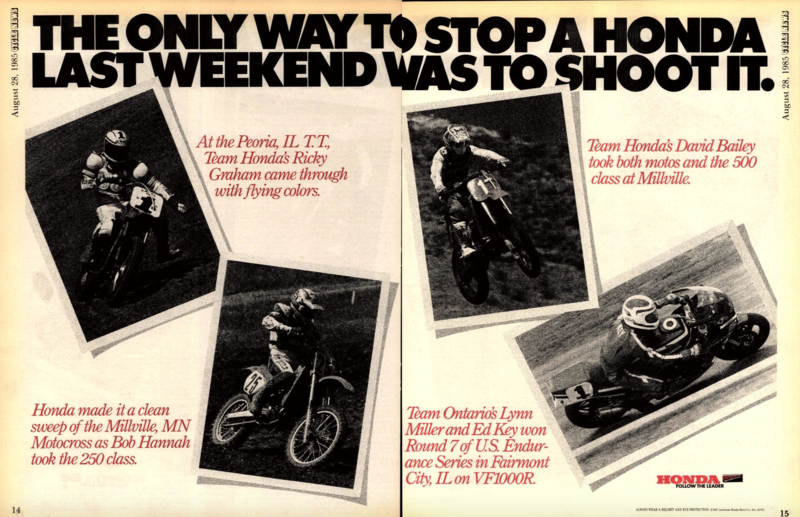 Second is JMB's teammate Jeff Stanton, third is Yamaha's Damon Bradshaw on an air-cooled 490. In the 125 Class Suzuki-mounted Mike LaRocco, a future two-time champion, took the win over Kawasaki's Mike Kiedrowski, a four-time AMA #1, and future two-time AMA 125 National Champion Steve Lamson.